Description: The body may be white or yellow in colour. The mantle is covered by rounded tubercles with conical tips. The rhinophores are lamellate, usually they are darker in appearance than the rest of the mantle. The largest specimen recorded was 17mm. Habitat: Usually found feeding on Electra pilosa, but it will eat a variety of encrusting bryozoans. This animal is common on the low shore and in the shallow subtidal amongst bryozoan encrusted seaweeds. Adults may be found spawning on fucoids from February to May. The spawn consists of a spiral ribbon of eggs. Distribution: A northern species in the British Isles, with a single doubtful record from Plymouth. Frequent in the Menai Straits, Strangford Lough and on Scottish coasts. 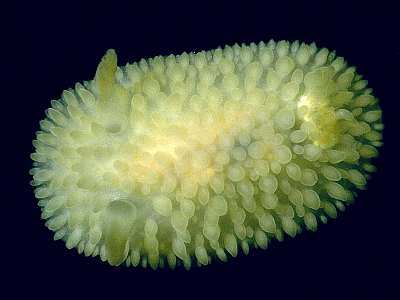 Similar Species: This species has often been confused with Onchidoris muricata however the rhinophores of A. proxima are blunter than those of O. muricata and the tubercles have pointed rather than flat tops. White or pale yellow animal with rounded tubercles. Picton, B.E. & Morrow, C.C. (2016). Adalaria proxima (Alder & Hancock, 1854). [In] Encyclopedia of Marine Life of Britain and Ireland.